Agile is becoming increasingly popular for school development in recent years. With an agile approach, developers break down a large project into shorter “sprints”. This approach allows for flexibility and adaptation to fluctuating needs. For example, with the spread of online learning, students may elect to read/watch their materials online, then come to the classroom for active work on group projects. We refer to this phenomenon as a “flipped classroom” approach. As schools and universities increasingly demand “flipped classroom” formats instead of traditional lecture halls, builders and contractors must adapt to the new demand. Another way in which schools can make their learning environments agile is with movable walls that create “shape shifting” rooms. Flexible room sizes are inherently adaptable way to organize a school towards current needs. Modular methods intrinsically lend themselves to a flexible format. The Modular Building Institute defines “modular” as a building that is made in a factory, then erected onsite. This is in contrast to traditional construction, where people create buildings onsite from scratch. Traditional buildings permanent and immovable, and have a lifespan of 100+ years. While modular buildings can be permanent and immobile, a positive feature of modular is that it could be temporary and/or mobile as needed. Modular is important to schools and universities because of fluctuating enrollment figures and changing methods of teaching/learning. It provides a cost-effective way for educational institutions to get the classrooms they need right now. Sprout Space is a new modular building design that Triumph created with our partners Perkins+Will. We see it as an alternative, sustainable classroom design to address the issues of energy consciousness, indoor air quality, and mobility. The result is a 1000 sq ft modular classroom, filled with natural light, that promotes good quality of air. The design lends itself to less construction time/cost and lower energy consumption. 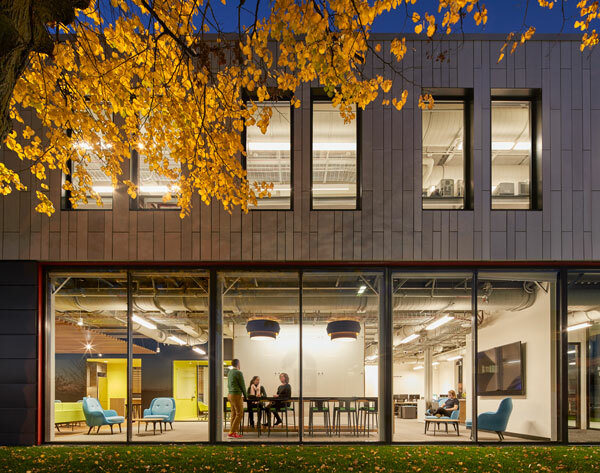 Harvard University’s Pagliuca Life Lab is another example of how modular can save time, money, and yet still create high performance buildings. It has cutting-edge plumbing, ventilation, gases, freezers, and other features fit for a state-of-the-art science research facility. There are 33 modules in this building but it looks like one uniform edifice. Besides reducing time and money, modular also gives us the ability to reuse and recycle buildings. Triumph once created a 5700 sq ft temporary childcare facility for Harvard in Cambridge. They used this facility while they waited for their permanent location to finish renovations. Afterwards, we relocated the temporary modular facility to Tufts. We added two new modules and transformed it into a Student Information Systems building. Modular construction is important to the world because it is inherently friendly to sustainable building practices. Furthermore, modular allows universities and schools to adapt their buildings to changing curriculums. To read more about this topic, download the free article. “The Challenge of Making Buildings Flexible: How to Create Campuses that Adapt to Changing Needs” by Cliff Cort, Glenn Cort, and Rusty Williams. With a background of 6 years in Higher Ed as an undergrad and graduate student, I bring a unique perspective to on-campus living. My interests include following trends in international finance, and a passion for digital marketing.